Manage BlackBerry email attachements with BeamBerry Software Suite 2.0 | BlackBerry Blast! BeamBerry Solutions, Inc. announced the release of the 2.0 version of the BeamBerry Software Suite. The key new feature introduced in this release is the ability for users to attach documents that they have stored on BeamDisk to new e-mails. The release also includes numerous improvements in the areas of performance, reliability and security, and contains fixes for several bugs discovered in previous versions (e.g. various problems with BeamPrint). 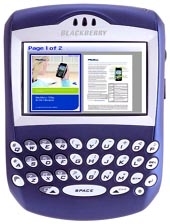 BeamBerry 2.0 requires RIM operating systems 4.1 and later. Users who still use 4.0 will need to upgrade their BlackBerry devices to OS version 4.1 prior to installing BeamBerry 2.0. This is a significant release and all current BeamBerry users are encouraged to upgrade to it as soon as possible. Over the last six months many BlackBerry users have decided to give BeamBerry a try and while the company has an ambitious roadmap for the product, customer feedback is given very heavy weight when prioritizing features. BeamBerry Solutions would like to thank all of the current BeamBerry users for their support and feedback. BeamBerry gives BlackBerry users the ability to view, print and store e-mail document attachments that they receive. The software supports PDF, MS Office (Word, PPT, XLS), and RTF formats, as well as ZIP archives. BeamBerry software works on virtually any BlackBerry model (running OS 4.1 and later), not just the latest model. BeamBerry viewer service, BeamView, enables BlackBerry users to view document attachments exactly as they would look on a regular computer. Users are presented with a thumbnail view of the pages in the document and can then open any of the pages, adjust the zoom level, move from page to page, etc. The quality of the documents viewed (i.e. text, images, formatting, etc.) is that of an original document. Opening a document attachment is very natural. All it takes is navigating to the e-mail message containing the attachment and opening it with BeamBerry. The document opens in a matter of seconds, with no extra e-mail messages arriving in your mailbox. BeamBerry printing service, BeamPrint, enables BlackBerry users to print their document attachments to a printer via Bluetooth. If the printer is not Bluetooth enabled by default, a Bluetooth printer adapter can be connected to the printer's USB port to make it Bluetooth enabled. BeamPrint supports over 1500 different printer models. BeamBerry virtual file system, BeamDisk, allows BlackBerry users to store their document attachments. Users can create various folders in which to organize their documents and perform various basic operations on the attachments (cut, copy, paste, rename). All documents stored on BeamDisk can be viewed and printed at any time. With this new release, these documents can also be attached to new e-mails. The original e-mails containing these documents can be deleted from the mailbox thus preventing it from being cluttered.